Henry Holt & Company, 9781627791892, 240pp. A spirited, wry, and utterly original memoir about one woman's struggle to make her way and set up a life after doctors discover a hole the size of a lemon in her brain. The summer before she was set to head out-of-state to pursue her MFA, twenty-six-year-old Cole Cohen submitted herself to a battery of tests. For as long as she could remember, she'd struggled with a series of learning disabilities that made it nearly impossible to judge time and space standing at a cross walk, she couldn't tell you if an oncoming car would arrive in ten seconds or thirty; if you asked her to let you know when ten minutes had passed, she might notify you in a minute or an hour. These symptoms had always kept her from getting a driver's license, which she wanted to have for grad school. Instead of leaving the doctor's office with permission to drive, she left with a shocking diagnosis doctors had found a large hole in her brain responsible for her life-long struggles. 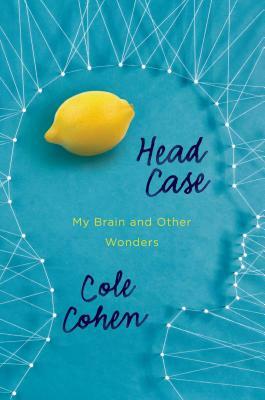 Because there aren't established tools to rely on in the wake of this unprecedented and mysterious diagnosis, Cole and her doctors and family create them, and discover firsthand how best to navigate the unique world that Cole lives in. Told without an ounce of self-pity and plenty of charm and wit, "Head Case" is ultimately a story of triumph, as we watch this passionate, loveable, and unsinkable young woman chart a path for herself. Cole Cohen graduated from the California Institute of the Arts MFA program in Writing and Critical Studies in 2009. She was a finalist for the Bakeless Prize and the Association of Writers & Writing Programs prize in Nonfiction and she has been a Yaddo Fellow. She currently lives in Santa Barbara, California where she works as the Events and Program Coordinator for UC Santa Barbara's Interdisciplinary Humanities Center.